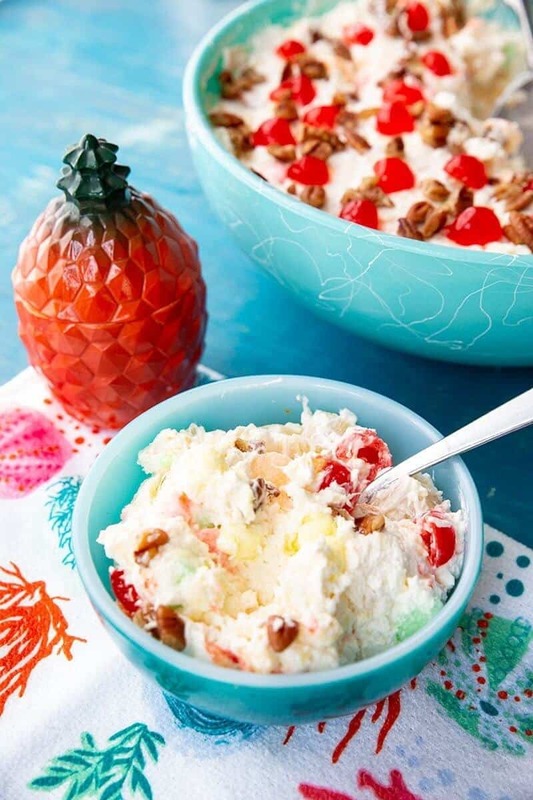 This decadent tropical Hawaiian Cheesecake Fluff Dessert Salad is going to be your new favourite summertime dessert! This is perfect for and BBQ or picnic this summer. A delicious, creamy cheesecake filling is mixed with pineapple and coconut and topped with cherries and pecans – the perfect dessert salad! 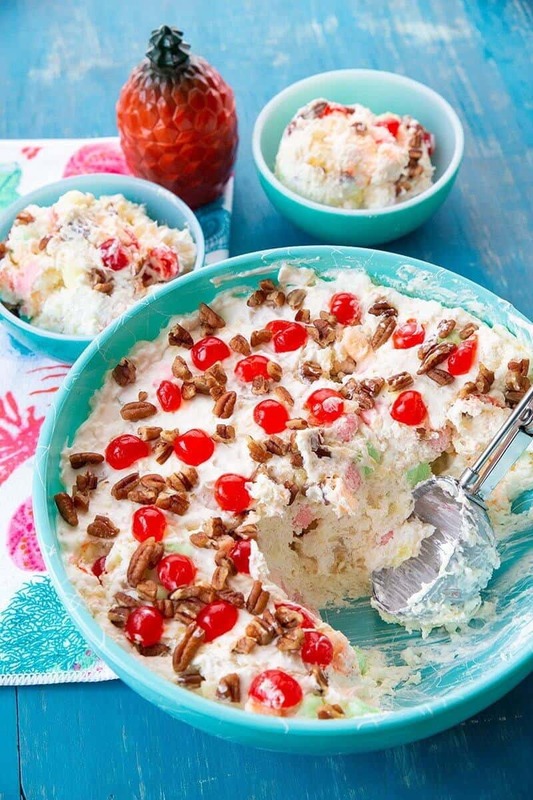 I associate dessert salads such as this one and my Watergate Salad as summertime fare, however I know that there are a lot of people that serve dessert salads with their winter holiday meals as well, Thanksgiving and Christmas. This one is very tropical and reminds you of palm trees and the hot summer sun…hammocks and coconut drinks…everything that is good about the hot summer months. Not that I won’t make this at Christmas because – will wonders never cease – Mr Magpie actually LOVED this dessert fluff. I didn’t actually make it for us, I made this to test out a new idea that I had and he ended up loving it! As with all dessert salad or dessert fluff recipes, you need to make this at least 4-5 hours ahead of time and then refrigerate it. The marshmallows need time to expand and soak up the moisture from the other ingredients in the salad, which then makes everything gel together perfectly – and it becomes scoop-able.It’s like a bit of Hawaiian Cheesecake without the crust! If you wanted you could also sprinkle graham crumbs on top as well! 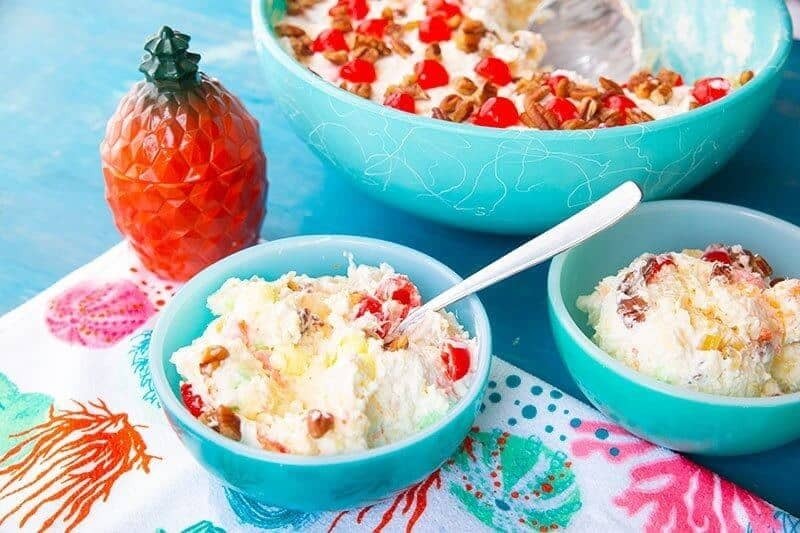 This decadent tropical Hawaiian Cheesecake Fluff Dessert Salad has a delicious, creamy cheesecake filling is mixed with pineapple and coconut and topped with cherries and pecans - the perfect dessert salad! In a large bowl, beat the cream cheese, condensed milk and lemon juice until smooth. Add the pineapple, coconut and 1 cup marshmallows;. Beat together the whipping cream, vanilla and white sugar until it forms soft peaks. Fold into the pineapple mixture and place into the serving bowl of your choice. Sprinkle the top with the nuts, cherries and remaining marshmallows. Refrigerate for 4-5 hours - or overnight. Make sure to watch the recipe video above for visual directions! Your site says video is unavailable. I make an ambrosia that is similar to this. Instead of while marshmallow, I use marshmallow fluff.